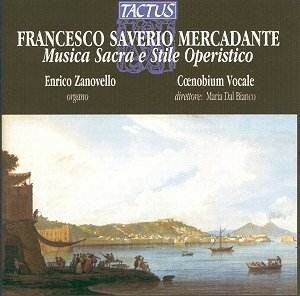 Recorded at the Chiesa Parrocchiale di Agugliare, Vicenza on 6 and 11 November 2003. Francesco Saverio (in full Giuseppe Saverio Raffaele) Mercadante was born before Sept. 17, 1795 at Altamura, near Bari, Italy and died Dec. 17, 1870 in Naples. Mercadante was an Italian composer and teacher who was a transitional figure in opera composition between Gaetano Donizetti, Gioacchino Rossini, and Vincenzo Bellini on the one hand and Giuseppe Verdi on the other. He is considered to have been an important reformer of Italian opera. Mercadante was born out of wedlock. He was taken to Naples at the age of 11, and in 1808 was enrolled in the San Sebastiano College under an altered name, date and place of birth. While a student there, he wrote a number of instrumental pieces, including music for three ballets. His first opera was premiered on Jan. 4, 1819. Less than three years (and precisely five operas) later, his Elisa e Claudio successfully opened at La Scala in Milan. Mercadante composed another popular opera, Caritea, regina di Spagna (�Caritea, Queen of Spain�; better known as Donna Caritea), in 1826. He was involved with Italian opera in Spain and Portugal from about 1827 to 1830. He married in 1832 and from 1833 to 1840 was maestro di cappella at Novara Cathedral. In 1835 Mercadante came in contact with the music of Giacomo Meyerbeer, and his next opera, Il giuramento (�The Oath�), performed in 1837 and considered to be his best opera, reflects the lessons he learned from that composer. Thereafter he continued to attempt a more harmonious blend of drama and music and led the way toward simplified vocal lines, originality, and thoughtful, serious composition. From 1840 until his death, he served as head of the Naples Conservatory. In addition to operas, he wrote sacred music, including a number of masses, cantatas and hymns, orchestral pieces, and a variety of chamber music. The links with Verdi and other operatic composers are clear; however I am afraid the level of composition nowhere near approaches his illustrious ancestors and successor. All these sacred pieces have organ accompaniment, and well though it is played, this leads to a sense of sameness and boredom. Add to this the paucity of invention and even triteness in the compositions, and one becomes rapidly disenchanted with the whole offering. The performances of the soloists and choir as well as the organists is fair enough, given that at times the soloists exhibit a degree of flatness in their pitch, but with such banal material with which to work, one cannot be too harsh on this count. The Grande Sinfonia is apparently a world premiere recording; one cannot help wondering did it ever need see the dawn of a new day? The only charitable thing I can think to say is that I suppose these examples may be useful in anyone taking a history of music degree, or an organ scholar, but otherwise they should be allowed to slowly sink back to their origins. The performances are as good as one could expect, given the subject matter, the recording is faithful and true, and the booklet is reasonably informative, with translation from Italian to English. Details of both organs registration are given.